Regular visitors to my site (there might be a couple; who knows?) may have noticed a change to the title from Strong and Coginchaug Technology Integration to Mr. Kurtz's English Classroom. As of the 2017-18 school year, I will be taking on a new role as a teacher in the Coginchaug English department. Most of my technology integration resources will remain on this site for the time being. I confess that it's in a little bit of disarray. If you are looking for something that you can't find here, please contact me and I will do what I can to help you. Breaking News or Faking News? As a classroom teacher I used to offer a senior elective in 'Intellectual Survival,' intended to build the skills students needed to navigate the new world of endless information. We examined how arguments were structured and supported with a special emphasis on how fallacies, errors, and shortcuts in logic and reasoning undermined seemingly convincing defenses of assertions. The class ran twice before I changed jobs to become a technology integrator but I often wish I was still teaching it as the modern world of 'fake news' provides fertile territory for analysis and the skills are more crucial than ever. ﻿Welcome to the Memory Palace! I'm fortunate to work with a very creative Latin teacher at Strong Middle School who's always ready to move her students beyond conjugating verbs and memorizing the gender of nouns. For example, we have twice collaborated on a project in which students learned about slavery in ancient Rome and then made connections to the ongoing problem of modern slavery and human trafficking. We started off by introducing the concept using this scene from the season 2 episode, "The Hounds of Baskerville," in which Holmes tries to recall the name and location of a research facility crucial the plot. Watson helpfully explains to another character what the 'mind palace' is and how it works (and takes the opportunity to offer a little dig at Sherlock's ego as well). We showed them a second, explanatory video from How Stuff Works to provide an idea of how a mind palace is constructed. We found the visuals in this video helpful but there are plenty more short segments on the technique out there. Find one that works for you. The biggest challenge was trying to figure out a way to have the students 'turn in' what is, after all, a very private and internal process. Much like Sherlock's producers do a great job of showing the inner workings of Holmes' mind, we needed to devise a way for the students to show the workings of their own. We decided to have them create a variation of a Pecha Kucha, or 20x20 presentation, in which the speaker's visual materials are strictly limited to 20 slides, each of which stays on the screen for 20 seconds. For this assignment, each student would take 10 photographs of places or things in their 'mind palace' where they would 'store' their selected characters and places from the Aeneid. They could mark the photos up with Google Drawing, Pixlr Editor or another online image editor if they chose. They then arranged their series of 10 photos into a Google Slideshow and used the 'Publish to web' function to automatically advance each slide after ten seconds. This gave us a '10x10' instead of a '20x20' and it meant that each presentation was a very tight 100 seconds. I created a sample, using our places around our school to help me remember ten U.S. presidents, which I narrated live for them in class. In retrospect, 10 seconds per slide was a little too tight and it might have been better to stick with a 10X20. They had about a week to put this together and on the day it was due, they published their slideshows to the web and presented them to small groups of 2 or 3 classmates. They used Nimbus Screenshot to record a screencast of their slideshow and their voice as they explained how each place in their mind palace contained something from The Aeneid. The screencast videos were saved to Google Drive and turned in through Classroom. Each group then chose one presentation to advance, tournament style, to a round in which the videos were shown to the entire class. This document has my notes for the project and links to some resources, including the videos embedded above and instructions for using Nimbus. Here's a planning guide given to the students to help them get ready. And finally, a rubric for assessing the project. 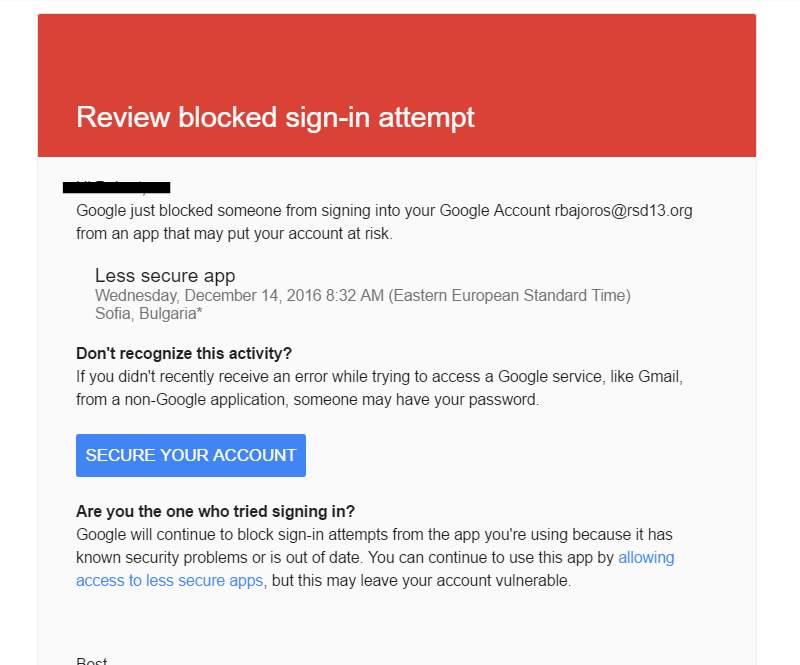 The two images above are screenshots, both purportedly from Google, advising users that their accounts may have been compromised and that they should take action to prevent unauthorized access. Only one of them is legitimate. Can you tell which? The image on the right is a real warning from Google, sent to someone inside the school district. The one on the left is a phishing email which was sent to Hillary Clinton campaign worker Billy Rinehart and which enabled a serious breach of security for the campaign when he fell for it. 'Phishing' is a technique used by hackers to gain personal information from an unsuspecting computer user. In a phishing attack, a hacker usually sends an email that mimics a legitimate communication from a company or service provider with whom you might do business--a bank, for example, or an email service such as Gmail. The message will typically direct you to a fraudulent website where you will be asked to enter log-in information for the service. The user might be advised that their bank account has been compromised and that they should log-in to look at suspicious transactions. Or as in the example above, that someone has tried to access their email account and they should log-in to change their password. Of course, the fraudulent website only collects the information necessary for hackers to access your bank account or email. Phishing attacks can target any website with personal or financial information, such as eBay, PayPal, Facebook or other social media sites, and banks. Be alert to the usual signs. Many phishing attacks originate overseas and they may be poorly written, with misspellings and odd grammatical structures. Phishing emails may use scare tactics ("Your account will be closed unless you . . . ") or promises of gifts or rewards to entice you. They may mimic the look of a company's legitimate website. No legitimate company will ever ask a customer to provide account information in an email! Ignore any such requests. You should also never enter account or other sensitive information into forms embedded in emails. Make it a habit to visit websites by typing their addresses directly into the URL bar, and not by clicking on links sent in email. For example, if you receive credit card statements by email, don't click on the link in that email to pay your bill but instead type the company's address in directly. You can bookmark it to save time. Buttons and links sent in email should always be viewed with skepticism! If a website requires a log-in, make sure it's secure: the URL should begin with https: ('s' for 'secure') and you should see a padlock icon in your browser's URL window. 1. Log in to a Windows computer (not a Chromebook or Mac) on the district network. 2. Once you are logged in, press Control+Alt+Delete. Choose 'Change Password' from the menu. 3. Enter your old password and your desired new one. You will be asked to enter the new one twice to confirm. This process will change your network log in and your Google account password will sync with it within moments. Changing your password within Google will not work. As always, please see your building's Technology Integration Specialist or fill out a trouble ticket if you have questions or concerns. Are you a Strong student interested in coding and programming? If so, you are invited to join an after-school learning community: #StrongCodes! We'll meet on Wednesday afternoons in the Strong LMC for six weeks, beginning on on January 6 to explore the fundamentals of computer programming using free online resources. We'll also have dedicated forum on Google Classroom where we can share, collaborate, and problem-solve as we work on self-guided projects. Join us as we learn with and from each other. Participation is free! See me or email me for the class code. Hour of Code at Coginchaug! Computer Science Education week is December 7-13 this year. I will have the Multimedia Lab (room 218) open for several blocks on Wednesday, December 9 and Thursday, December 10th for any students who want to try their hand at one of several self-guided introductions to computer programming during their study halls or tutorials. Interested students can sign up using the form below. As RSD 13 teachers, we're committed to helping our students grow in good citizenship and personal integrity, as represented by the Core Ethical Values of Honesty, Responsibility, Kindness, Respect, Kindness and Courage. We look for ways to reinforce those values by integrating them into our lessons like any other fundamental skill. With so many multimedia projects depending on photos, video, and graphics pulled from online sources, the Google image search is a useful venue for emphasizing the importance of Respect, Responsibility and Honesty since the propriety of using 'Google' images is often overlooked. Students often do not know that 'Google images' is not a content creator cheerfully providing (for free!) photos and graphics for their projects but rather a sophisticated method of sifting through the millions of pieces of digital content found online. They often do not stop to consider that the creators of that content have rights which honest citizens have the responsibility to respect. You can help students meet these obligations by encouraging (or requiring!) them to ethically source images they use or modify as part of class projects. This slideshow explains the importance of copyright and how to use the tools built into the Google image search to find photos and graphics licensed for reuse or modification. The CRHS LMC specialist has a school subscription to Encyclopedia Britannica which has a library of images that includes the proper MLA format citation information. Other sources of public domain or Creative Commons images include the Flickr Commons and the Wikimedia Commons. This brief video demonstrates how to use the Google image search tools to find content licensed for reuse and modification. ​The Hour of Code is a global movement reaching tens of millions of students in 180+ countries. Anyone, anywhere can organize an Hour of Code event. One-hour tutorials are available in over 40 languages. No experience needed. Ages 4 to 104. Any teacher can sign up through the website to host an hour of code in their classroom but you don't even have to sign up. Talk to me details! Users can add links and pictures to their timelines, but at present there doesn't seem to be a way to directly embed videos. Another drawback is that it seems to be impossible to remove the month and day from an event, so if you're creating a timeline about ancient Egypt, for example, you had better be prepared to guess at King Tut's birthday. But aside from these small quirks, it's a versatile and easy-to-use tool. The Feature You've All Been Waiting For . . .